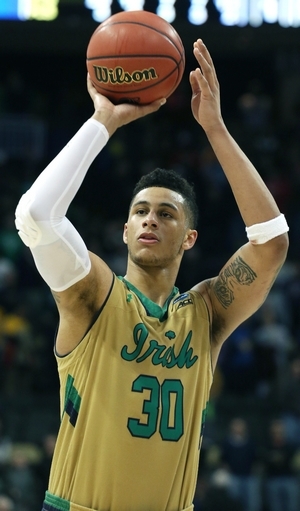 Jacob breaks down Zach Auguste, a senior forward for the Notre Dame Fighting Irish. Zach Auguste came to Notre Dame as a moderately heralded recruit out of New Hampshire in 2012, and while his first two seasons in South Bend were encouraging based on per-minute production levels, it wasn’t until last season that he finally emerged as a legitimate NBA prospect. Auguste was the only post-threat on Notre Dame’s ACC championship team and eventually helped guide the Fighting Irish to the Elite Eight in the NCAA Tournament. At 6’10, 240 pounds, Auguste is big for ACC standards, but projects as a bit of a tweener between the four and the five at the next level. He has average length, which will work against him on the defensive end for his entire career. Still, he’s strong, mobile and physical and can get to his spots on the floor effectively. At Notre Dame last season, Auguste used his size to gain advantage against opponents in the paint, leading to a gaudy 21.1 points and 10.6 rebounds per-40 minute rate. Auguste had free reins on offense when he got the ball in the paint last season. He had the highest usage rate on Notre Dame, and posted a sparkling 63% true shooting percentage. More impressively, Auguste was as close to automatic as they come around the basket. He converted on 120-of-165 (72.7%) field goal attempts around the hoop in the half court – per Synergy Sports Technology – due to his soft touch and strong finishes. Auguste’s best attribute as an NBA prospect is his nimble footwork. It makes sense that Auguste moves well, considering his father was a semi professional soccer player in Haiti. While Auguste doesn’t take particularly long strides, he gets up and down the court at an impressive speed for a player his size. He also has good hands and manages to catch tough passes in motion – all while stopping his feet on a dime with ease – to finish transition opportunities before travelling. With Notre Dame’s desire to spread the floor and play quickly, Auguste’s efficiency on the interior is an ideal complement for the Irish’s shooters. In transition, Auguste converted on 36-of-45 field goal attempts (80%) and rarely turned it over. While Auguste has a reputation for being Notre Dame’s only post threat, the truth is Auguste isn’t actually all that effective working with his back to the basket. Auguste made just 30 of his 85 post attempts last year and couldn’t seem to find consistency with either hand shooting over either shoulder. To make matters worse, 20.7% of Auguste’s post attempts resulted in turnovers – an absolute stain on Mike Brey’s otherwise hyper-efficient offense. Auguste does make up for his turnover rate with an impressive ability to get to free throw line. Last season, Auguste averaged 6.7 free throw attempts per-40 minutes and .39 free-throw attempts per possession – both ranking among the best in DX’s top-100 prospect database. He has tremendous balance, which allows him to battle for positioning in the low post without getting pushed off his spots. The balance also allows him to grab offensive rebounds and finish through contact with consistency, a skill that accounts for a healthy portion of his scoring diet. Auguste grabbed 12.5% of all available offensive rebounds last season, ranking eighth among all NCAA prospects last season. Auguste isn’t particularly dynamic offensively. He attempted just a handful of jump shots outside of the paint last year and has yet to make a three pointer in college. His jump shots have a flat arc and seemingly always hit the back rim. While he’s able to use his size to create scoring opportunities at the college level, it’s unlikely those same opportunities will be available against professionals, which will require him to expand his range, particularly if asked to operate at the power forward spot. Though he fights on the interior, Auguste is slightly undersized and allows deep positioning without much resistance against bigger and stronger opponents. At 240 pounds, Auguste is not weak, but he will still need to get significantly tougher and more physical to defend comfortably at the next level to compensate for his lack of length. Currently, he’s a bit of a turnstile in the paint. Overall, Auguste’s big junior season made him a legitimate NBA prospect. While his role figures to expand with the departures of Jerian Grant and Pat Connaughton, Auguste will need to show more versatility on both ends of the floor to impress scouts in his senior season.